Cholamandalam MS General Insurance Company Limited has been certified with ISO 31000:2018 by TUV India for applying a risk management system inline with the standard. ISO 31000:2018 is an international risk management standard. The standard provides guidelines, principles, framework, and a process for managing risk. It can be used by any organization regardless of its size, activity or sector. The application of these guidelines can be customized to any organization and its context. The Company has put in place a comprehensive risk management system to promote an innovative culture with proper understanding of risks, to add sustainability to all the activities of the organization and to ensure adequate profitable growth which itself minimises enterprise risks. 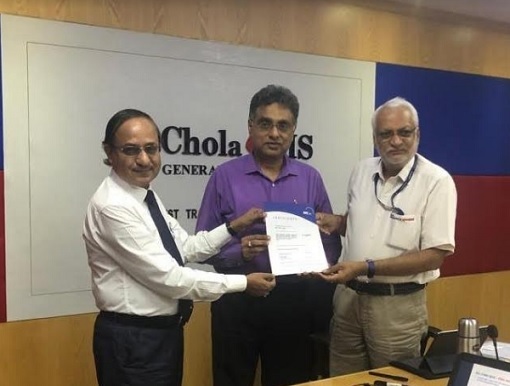 Chola MS General Insurance Company Limited is a joint venture between the Murugappa Group and Mitsui Sumitomo Insurance Company Limited, Japan. Chola MS offers a wide range of insurance products that include Accident, Engineering, Health, Liability, Marine, Motor, Property, Travel and Rural insurance for individuals and corporate. In the financial year 2018-19, the company achieved a Gross Written Premium (GWP) of INR 44,290 million. Chola MS currently has 90 branches and over 8865 agents across the country. Chola MS champions a brand philosophy called T3, which stands for Trust, Transparency and Technology. It has also been consistently recognised and awarded by the Government of India, international entities and ratings agencies for its insurance service and delivery innovations. Please visit www.cholainsurance.com to know more about the company and its products.